Su studied art whilst living in Minnesota, USA which, together with sailing have become her life long passions. As a former world class sailor who's competitive sailing career included representing Britain at both Class and Women's World Competitions, she spent many hours on the water in all weather conditions. Her fascination now lies not only with the yachts themselves, but in their association with the movement, textures, and reflections in the water under ever-changing skies. 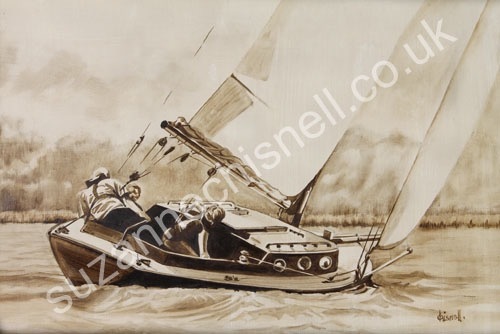 Whilst living on the south coast of England she began producing paintings of ocean racing yachts and now paints these beautiful subjects as seen in the Norfolk Broads and along the traditional East Anglian coastline, working in oil both in the studio and en plein air. Combined with exhibiting her work in galleries around East Anglia, in 2015 she held her first solo exhibition in Norwich and her first 'Pop-up' exhibition at the Hall on the banks of the river Yare in the Summer of 2014. Su is a full-time professional artist working from her studio in North Norfolk.